FranFrog is a Franchise Consulting Agency. Our company was founded to help individuals find steady income through business ownership. The job market has changed and the only for sure thing is YOU. People are disenchanted with corporate jobs or are too young to retire. Franchising provides a “recipe” for success. 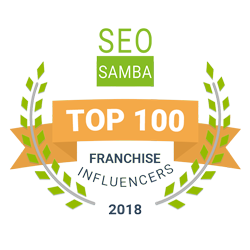 The network we are affiliated with provides access to a portfolio of pre-screened franchise companies with more than $3 billion in annual revenues. These franchise companies include home based, on-site services and brick & mortar retail businesses. FranFrog will review your skills and match you with companies that give you the opportunity to make money and enjoy your success. We work all across the United States helping ambitious entrepreneurial minded people achieve their goals by giving them access to great, profitable companies. Find out if Franchising is right for you! Consult with a Franchise Consulting Agency by calling 1-800-388-2810.